you look so pretty! mixing prints is always fun, and stripes with flowers is the best mix possible! you've nailed it. I also really like your boots. These mix of prints is so flirty love it! I love ankle boots with miniskirts! you look like a french girl! I like the pattern mix. Love the location in these! It looks so pretty! Love the colours/ pattern in your skirt with the leaves in the background! I might also do a stripes and floral combo! And wow, short hair does look so elegant you, Kallie! Lovely mix in patterns here. I love the floral dress paired with the striped sweater, really cute and easy-going look! 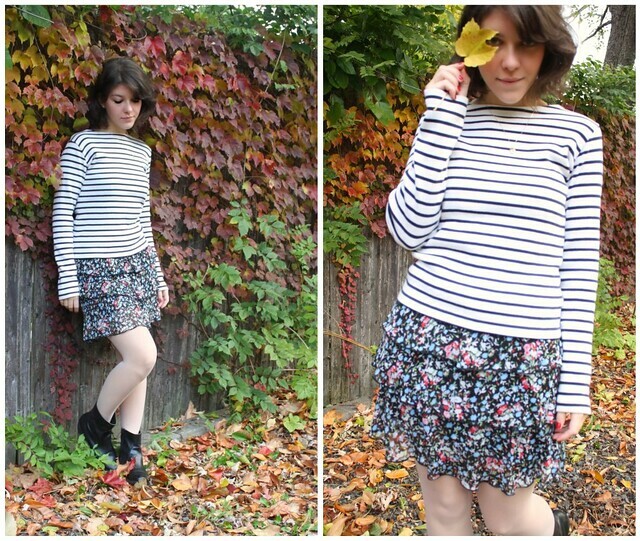 Love the stripes and flower combination and the white tights are perfect with it! And that adage about changing clothes... I need to remember that one when it's 8:58, I've got class at 9, and I'm in my skivvies with a pile of tried-on clothes next to the mirror. beautiful skirt! i love how you pair it up with that jeans! <3 lovely girl..
You pull this off really well. 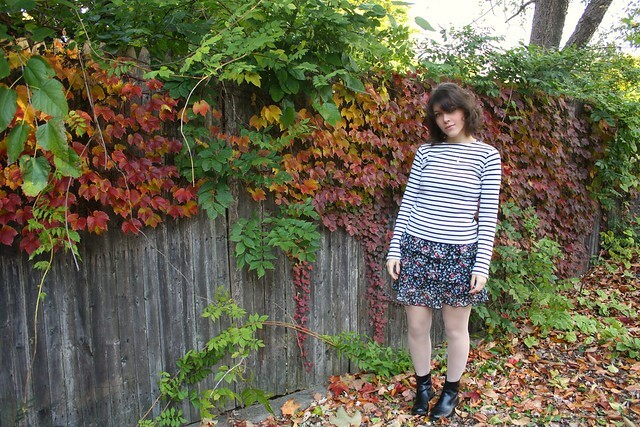 I'm not sure I've liked the stripes and floral thing on other blogs, but I really like it here. Especially with the red nail polish picking up on the skirt. you look like you might be interested in vintage clothing and if you do please come check out our vintage site! Hey there! Thanks so much for commenting on my blog! !